If you weren’t living as a hermit in the desert, you’d have been well aware that 22 November 2013 marked the 50th anniversary of the assassination of US President John F. Kennedy. But the wall-to-wall coverage of that event obscured the anniversary of another presidential assassination that took place just three weeks before, and had almost equally far-reaching effects on world events, not least for Australia and its region. 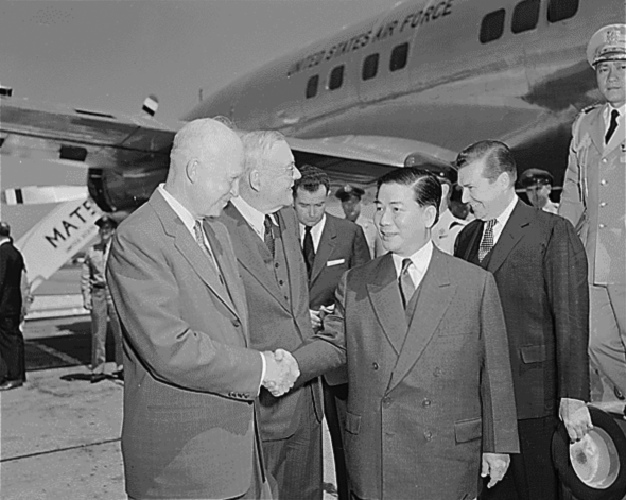 On the night of 1 November 1963, President Ngo Dinh Diem of the Republic of Vietnam (commonly known as South Vietnam), and his brother and chief political adviser, Ngo Dinh Nhu, were assassinated during a coup executed by a military junta, acting with the knowledge and support of the United States. This has long been seen as one of the most important in the series of mistakes that led to massive American military intervention in Vietnam (itself seen as its greatest strategic error in the Cold War if not indeed the whole 20th century). By conspiring in the assassination of Diem, the US virtually committed itself to supporting any regime in Saigon that would oppose the communists. The junta that deposed Diem was itself rapidly deposed, leading to a rapid ‘revolving door’ succession of governments, each less credible than its predecessor. Not until the US was fully engaged did Nguyen Van Thieu emerge as the most credible of the military leaders. By this stage the US effectively trying to create a democracy rather than defend one while fighting a major war (a time when even well-established democracies often accept restrictions on their democratic processes that they wouldn’t accept in peacetime). How did this happen? Diem had come to power, by rather dubious means, soon after the Geneva Accords of 1954 that divided Vietnam along the 17th parallel into a communist North and a non-communist South. Elections in 1956 were supposed to re-unite the country. In a blatantly rigged referendum in 1955 Diem deposed Bai Dai, the last Vietnamese emperor, and had himself appointed President. Many doubted that he would last even to the 1956 elections, which were never held, but he initially proved surprisingly effective at suppressing the communists and other rivals. As part of the process of cementing his support in the West, Diem visited Australia in 1957, which was in fact the first visit to Australia by a foreign incumbent head of state. It was from a sense of weakness in the face of Diem’s suppression that in 1959 the communists decided to take up armed struggle in the south, forming the National Liberation Front the following year. In the early 1960s, as the communists rapidly increased the numbers and effectiveness of their forces in the South—the so-called ‘Viet Cong’—Diem’s increasingly authoritarian rule alienated many. His strongest support had always come from those Roman Catholics who, like Diem and his own family, had ‘regrouped’ from the north to the south after the 1954 partition. Diem’s increasingly blatant reliance on the Catholic minority alienated many Buddhist groups. Tensions led to the suicide by self-immolation of a Buddhist monk in July 1963, an act welcomed by Diem’s sister-in-law, the notorious Madame Nhu, as a ‘barbecue’. The pre-arranged photograph of the monk’s self-immolation was the first of a series of still photographs that had a huge influence on one of the most important battlefields of the Vietnam War: the contest for American public opinion. The antagonism between the Diem regime and militant Buddhist groups brought to a head the growing division in Washington between those who thought the United States had to ‘sink or swim with Ngo Dinh Diem’ and those who sought to endorse a coup against him. Amid intense and bitter manoeuvring in Washington, the latter prevailed. Debate over responsibility for American encouragement for the coup continues to this day. The assassination of Diem and Nhu is often cited as a ‘CIA coup’, but it seems highly likely that the Director of the Central Intelligence Agency, John McCone, was initially opposed, as were the Secretary of Defense, Robert McNamara, and the Secretary of State, Dean Rusk. The principal instigators were almost certainly two senior State Department officials, the venerable Averell Harriman and his young protégé, Roger Hilsman. It was neither the first nor the last time in Washington’s inter-agency process that State Department diplomats would espouse belligerent policies while the Pentagon’s leaders looked to diplomatic solutions. There’s a noteworthy Australian dimension to this episode. Malcolm Fraser, who was Minister for the Army and later Minister for Defence during the Vietnam War, claimed  that he first heard of American involvement in the Diem assassination in 1995, when Robert McNamara published his apologia and critique of the Vietnam policies of the Kennedy and Johnson administrations. Fraser’s dismay at hearing of Washington’s willingness to conspire in the assassination of a pro-American head of government is understandable, and he’s cited it in explaining his transition to a leading critic of American policy. But critics have questioned  his claim to not know of it much earlier, because the involvement of American policy-makers in the coup has been debated and analysed for decades. It’ll be interesting to see what reference Fraser makes to this episode in Dangerous Ally, his forthcoming critique of Australia’s relations with the United States. Peter Edwards is an adjunct professor at the Alfred Deakin Research Institute of Deakin University. He is the official historian and general editor of the nine-volume Official History of Australia’s Involvement in Southeast Asian Conflicts 1948–1975. Image courtesy of Flickr user manhai .